1933 Maine Inspection Sticker - $20.00 : Bob Hoyts Classic Inspection Stickers, Add a Final Touch to your Restoration! 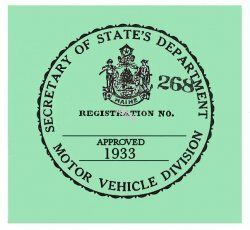 Maine is said to have begun issuing Inspection stickers in 1930 or quite possibly 1932.
and expired in 1934. Maine began spring and fall inspections in 1934 and continued them until 1964 when they changed their system . This sticker, originally a waterslide, has been restored and reproduced to perfectly match the original in size and color . This sticker was blank in back. It has our patented "Peel and Stick" feature that allows attaching to the inside passenger side of your windshield. For an additional $10.00 this sticker can be ordered with your license plate number on the front.